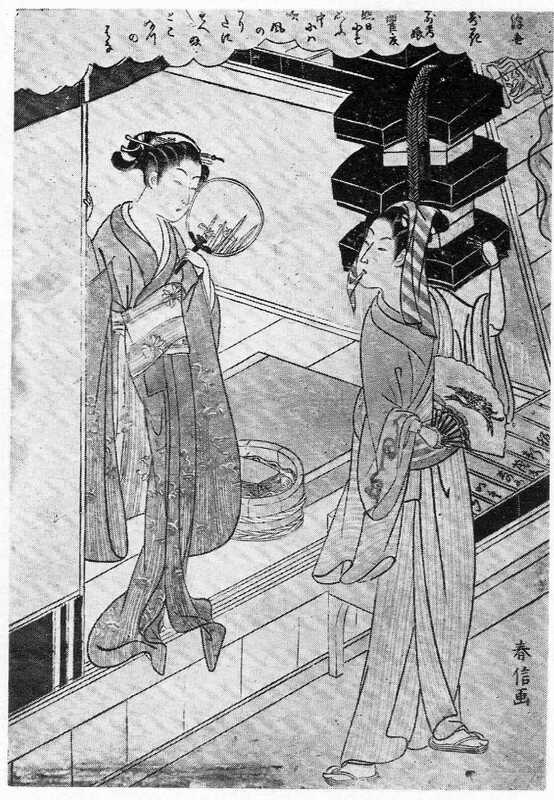 Rokō musume, the young woman standing in the entryway, is looking at the young man (?) who is carrying a stack of boxed fans and looking back at her. The name Rokō is a reference to the actor Segawa Kikunojō whose poetry name was Rokō. His mon or crest is a bundle of silk floss (yuiwata) tied off in the middle. This is part of the design of obi of Rokō musume further strengthening the connection with the famous actor who specialized in female roles. Other plant motifs are visible in this print. Bracken decorate the lower part of the wall of the interior and Rokō is holding a fan with an iris pattern. On the other hand, the sleeve of the robe of the fan peddler shows a chain of monkeys linked one to the other. This can be seen best in the example in Boston. There are no wild carnations here. the flowers of the wild pink! 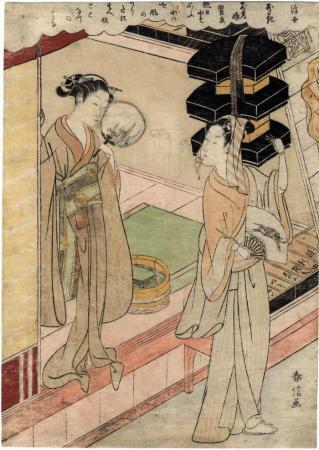 Jack Hillier speculated about a short text published in 1769, Azuma no hanajiku, which refers to Segawa Kikunojō II as Rokō-musume where great beauties are compared to famous actors. There is another copy of this print in the museum in Philadelphia.